​It sounds like something out of Game of Thrones: Attack the weakness. Today, we apply the phrase to a more important and real battle – the one against breast cancer. How do PARP Inhibitors work and what might they mean for attacking cancers’ weaknesses? That’s just part of what I discussed with Dr. Ashworth. Some background: He’s the President, UCSF Helen Diller Family Comprehensive Cancer Center; Senior Vice President for Cancer Services of UCSF Health; and a Professor in the Division of Hematology/Oncology at UCSF’s Department of Medicine. Dr. Ashworth is an elected member of EMBO, the Academy of Medical Sciences, and a Fellow of the Royal Society. He has won a number of the world’s leading scientific prizes and awards, and he’s also a BCRF Investigator since 2008. Chris Riback: I'm Chris Riback. This is 'Investigating Breast Cancer,' the podcast of the Breast Cancer Research Foundation, and conversations with the world's leading scientists studying breast cancer prevention, diagnosis, treatment, survivorship, and metastasis. Attack the weakness. It sounds like something out of Game of Thrones, but today, we apply the phrase to a more important and real battle: the one against breast cancer. As you'll hear, Dr. Alan Ashworth is part of a team that developed something called PARP inhibitors; and quite creatively, identified ways to use them to attack the weaknesses of various cancers, including breast cancer. As a recent new report noted, with three recent FDA approvals and a number of phase three trials ongoing, the drugs are seeing a surge in interest. How do PARP inhibitors work, and what might they mean for attacking cancer's weaknesses? That's just part of what I discuss with Dr. Ashworth. Some background: he's the president of UCSF Helen Diller Family Comprehensive Cancer Center, and senior vice president for Cancer Services of UCSF Health. He's also a professor in the division of hematology and oncology at UCSF's Department of Medicine. Dr. Ashworth is an elected member of EMBO, the Academy of Medical Sciences, and a fellow of the Royal Society. He's won a number of the world's leading scientific prizes and awards. He's also a BCRF investigator since 2008. Dr. Ashworth, thanks for joining me. I appreciate your time. Dr. Alan Ashworth: It's a great pleasure to talk to you, Chris. 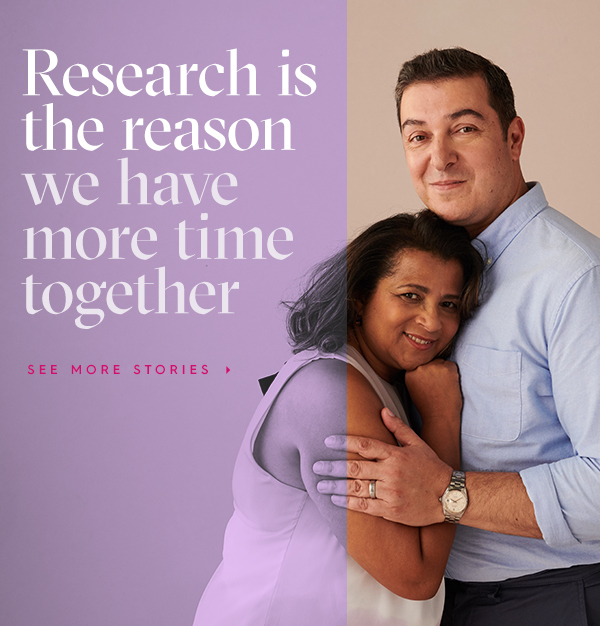 Chris Riback: It seems like the heart of your research, the impetus, if I'm understanding it correctly, comes from a simple and confounding fact that the specifics of breast cancer can differ significantly from one person to the next. Is that right? Dr. Alan Ashworth: Indeed. It's probably right to say that each breast cancer is unique. The genetic changes in each breast cancer are all different. That leads to this counterintuitive diversity that we've seen between breast cancers. Of course, even though everyone is different, they can be grouped into classes. We need to pay attention both to the similarities and the differences between cancers. Chris Riback: One focus of your research is to understand how various gene mutations, and I guess those various mutations certainly get at why we both must treat each case uniquely, of course, but also create some types of groupings and categories that various gene mutations affect tumor cell behavior, and how to identify targets to reduce resistance to anti-cancer therapies. That's what I'm interpreting as at least one focus of your research. Explain that to me, if you would. What does that mean? Dr. Alan Ashworth: Yes, well perhaps I should just give you a little historical background of how we got to that subject that you've just described. Dr. Alan Ashworth: I've been very interested for the last 20 odd years in why some women are at a very high risk of breast cancer, and ovary cancer, and men with prostate cancer. There are some genes that we know about that we've identified called BRCA1 and BRCA2 that give a very elevated risk. I was involved in the finding the BRCA2 gene in 1995. That's driven a lot of my research subsequently. We were able, along with many colleagues, to understand why a BRCA mutation led to this elevated risk. It came down to a defect in the ability of cells with this mutation to repair their own DNA. DNA became more mutated in these individuals, than it does in individuals that don't have this mutation. That actually is the underlying cause of cancer, just a higher mutagenic rate. We can separate those cancers from other cancers that don't have that property. That's the first thing is that we can identify women at risk. There are options, rather unpalatable options, but some find it preferable to living with a risk of cancer. Removal of at-risk organs; the breasts and the ovaries. That's the first thing. It allows us to look into families for those at risk. Second thing is it gives us an understanding of what causes the cancer. That has led to work from our lab in 2005 demonstrated that although one gets an increased risk due to this mutation frequency, elevated mutation frequency due to the inability to repair DNA properly, it also provides an opportunity. That opportunity is to treat with drugs that make that condition worse. I should just explain what I mean by that. Dr. Alan Ashworth: Many cancer treatments attack things that cancers have learned how to do, like grow fast. Chemotherapy kills fast-growing cells, which is why it is somewhat cancer selective. We took a counter-intuitive approach where we said, 'Well, this DNA repair deficiency is driving the cancer. It actually provides a weakness. Let's attack this weakness.' Rather than saying, 'Let's fix the problem, we make the problem worse by adding in a drug that also blocked DNA repair, drugs called PARP inhibitors. It turns out that these BRCA mutant cells, and some other related cells, are uniquely sensitive to these agents. Maybe a thousand times more than cells that don't have a mutation. That observation was enough to drive clinical trials in this area. After a long and very involved process, these drugs were approved to ovarian cancer in 2015, and breast cancer a year or so ago. They would be part of the standard treatment now for BRCA related breast and ovary cancer and probably will expand out to prostate cancer. Dr. Alan Ashworth: So you can see that summary of 20 odd years work, and the journey from basic discovery through to application of a therapy. Chris Riback: Isn't it nice to be able to boil 20 years worth of work down to two minutes of explanation? Dr. Alan Ashworth: It seems only yesterday. Chris Riback: I'm sure it does. Neither you nor I have aged a bit since then. Two points I want to follow up on. One, yes, the PRP inhibitors, PARP inhibitors, the results and what's occurred in just the last couple of years; extraordinary. I want to pick up, you identified it was counterintuitive. You identified instead of attacking the ... reducing the results or attacking the outcome, I guess you were saying, you went right at the problem itself. Is it something about you? Is it something about the colleagues that you were working with? Is it something that I know that you work as well, you're a translational scientist, maybe we talk about what that means. What's so wrong with you that you thought counter-intuitively about the problem? Dr. Alan Ashworth: Well, I'd like to say I woke up one day and said, 'Eureka,' but it very rarely works like that. It's about being prepared. All the stuff you do before prepares you for the moments of insight. We'd been working on the function of BRCA1 and BRCA2, what they did in normal cells. We knew about DNA repair. We're thinking about vulnerabilities. We, in fact, already piloted approaches, similar approaches using existing chemotherapies, platinum chemotherapies that weren't, at the time, widely used in breast cancer. We were kind of thinking along the right lines, and a series of accidents and opportunities led us to try out these PARP inhibitors with the aim of finding this vulnerability. I have to tell you that our expectations that the effect would be so profound, we never had that expectation. We thought there might be some activity, but when we saw those first results, the thousand fold sensitivity, we just went, 'Wow, this has to be real. It has to be important.' What happened then, again, it was about having a lot of close colleagues, clinical colleagues, and basic colleagues. We were able to move this into a clinical trial incredibly quickly because there was a trial already being developed. We were able to adapt that trial. That was only because we were in the right place at the right time. It also speaks to the power of collaborative working. I think in the modern world of cancer research, this is a way that insights and developments will be moved through rapidly. It still does happen, the people publish papers with one person on them, or two people working on their own in a lab. It's very difficult to move that observation to clinical benefit, unless you have a team. Chris Riback: If I were to give you two of the key themes that I have gained from these conversations with the leading cancer researchers, and biologists, and computer scientists, and so on, that I've had the privilege to talk to from around the world. One is the point you just made. There is hardly a go-it-alone approach. As you mentioned, every once in a while, you get that and it's terrific as well, of course. We'll take those wins, but the collaboration is key, too. I wonder if you have felt this. The ability to take insights from one area of cancer and research that's going on in one part of cancer in one part of the body, and then applying it to another. I guess in this case, with these conversations quite often, breast cancer. Do you find that as well? I know you mentioned that the PARP inhibitors, you're doing work and it's involving breast cancer, ovarian cancer. You expect it to hit prostate cancer as well. This ability to take lessons and insights from one area of cancer research and apply them to others, just seems transformational to me. Am I getting that right? Has that been your experience as well? Dr. Alan Ashworth: Yes. No, I think that's perfect. I think one of the interesting things that happened in this story is that we started working on breast cancer, and we were a breast cancer lab. Then, when the drug was supposed to prove, to get an approval in ovarian cancer first, and then breast cancer later. Then it will, as you said, we've now started working somewhat on prostate cancer; because we want as many people to benefit from the approach as possible. I think it speaks to there have been criticisms of breast cancer charities, and the funding for breast cancer is disproportionate to other cancers. I think that first of all, I don't agree with that. I think it means we need more funding in other cancers, not less funding of breast cancer; because it still is a major killer of women and men around the world. Also, what we've learned from breast cancer cascades down into so many other areas, not even just cancer but primarily cancer. There are many drugs that have been developed for one cancer that get ... become useful elsewhere. That's been our philosophy all the way through is if we can exploit what we've done, and others can benefit, I don't think anybody would object to that. In fact, we should be doing. It's our obligation to do that. Chris Riback: Yes, indeed. I mentioned a moment ago that you are trained in [AC-T 00:13:19], I believe as well, as a translational biologist. I think we've touched just slightly on that, but not quite as much as what those words actually mean. How do you explain what it means to be a translational scientist, a translational biologist in your case? How important is the translational part for you? Dr. Alan Ashworth: Yes. In fact, I didn't train as a translation biologist. I trained as a basic biologist in fundamental mechanisms of cellular behavior and genetics. I self taught, in fact. What happened was it was after we were involved in the discovery of the BRCA2 gene, I became much more interested in the application of what I did. That's why I started to think about drug development. I started to work with clinicians. I started to think about the disease at the patient level. That then positioned me in this translational role. Because of my training, I had the ability to speak to basic scientists. I learned the ability to speak to clinicians through spending a lot of time in conversation, and on tumor boards, such like. That meant that I had some skills in moving things from one area to another; and also back again. People, this translational term implies unit-directionality from the lab, from bench to bedside, as often said. I don't believe in that. I think it has to be fully integrated. You can learn from the patient, and bring it back to the lab. That's where we started with this conversation is our work on mechanisms and drug resistance. Everything we know should come from the patients about drug resistance, as well as from the laboratory, and go back and forward. Having samples from patients that have become resistant, and then models that we develop in the lab. I think that iteration between bench and bedside, in a more integrative work, I think is a better reflection of what we should be doing these days. As my career has developed, I'm now director of the Cancer Center at UCSF, and I have responsibility for both cancer research and cancer clinical services. This is a kind of ultimate version of translation, because my aim in doing both of those things is to make sure that patients can benefit from the research as quickly as possible. We also take what's happening to patients and bring it back to the laboratory. Chris Riback: Interesting to learn that you transformed into a translational biologist. You weren't born that way. Dr. Alan Ashworth: Yes. I didn't wake up one day. I think it was a gradual transformation. Dr. Alan Ashworth: I think that's my best zone is ... what's the phrase? Master of none. Dr. Alan Ashworth: Fiddling in many areas. Chris Riback: I'm sure, I'm sure. Yes, that seems to be how you're described out there. Yes, master ... Well, maybe some day you'll accomplish something. You keep working at it. You'll get there. In terms of that gradual approach, how did you get into the science and research field in the first place? Going way back, was it always science for you? I hear a British accent, of course, so I can only imagine that staring on the English national team ... I assume English, was a goal of yours; and at some point, perhaps you felt that, that wasn't going to work out so why not give science a try? Did you grow up in a science family? Dr. Alan Ashworth: No, I was the first person in my family ever to go to college, in fact. Not really an academic environment at all. I was lucky enough to go to a good school. It's hard to recall exactly what the thought process was to science. I think it was I had an aptitude, I had an enjoyment of it. I considered medicine for a while, and ended up doing research, doing a science undergraduate degree, and then doing research. The way things have ended up, I'm very close to the clinic anyway. I think I don't have any regrets about the path I took. It's ended up being reasonably fruitful. It was really the aptitude thing, I think. Dr. Alan Ashworth: Or indeed, soccer. Chris Riback: Or soccer. Sorry about that, football. You're a translational biologist, so I know you were able to translate my Americanism. Dr. Alan Ashworth: That's right. Chris Riback: What about the BCRF? What role have they played in your research? Dr. Alan Ashworth: Well, one of the great things about the BCRF and the funding I receive from the BCRF is that they support risk-taking research. I think the sense you've got from what I told you about the development of PARP inhibitors is it was far from an obvious path. I actually never had a grant that said I'm going to develop a synthetic legal PARP inhibitor approach to treating cancer; because basically it would have never got funded. I happened to have the resources in order to take the risk, and BCRF has allowed me to continue to try, and innovate, take risk. Implied in taking risk is the possibility of failure. I don't think there's anything wrong with that. One wouldn't want to fail all the time, but I think an element of failure, and embracing risk allows us to take innovative leaps that one otherwise couldn't do. I've always felt terribly supported by BCRF to do that. With our current funding, we're trying to investigate other ways to find weaknesses in tumors, and challenge drug resistance. Chris Riback: And so tell me about that, and that's exactly what I wanted to ask you to close. What is next? Not to appear ungrateful for the history of findings that you've made, but what's next? Will you continue down this road with PARP inhibitors, and maybe try to identify additional uses and ways to affect cancer, and hopefully stop cancers? Or, are there other avenues that you foresee potentially working on? Dr. Alan Ashworth: It's both. I think with PARP inhibitors, we have our foot in the door of what's turned out to be a much larger class of tumors than we thought we were able to treat. The next play will be combination therapies. Everybody's excited about immunotherapy. We think it's very likely we're going to be able to combine the genetic approach with PARP inhibitors with immunotherapy. I want to get to curative treatments. I know people shy away from talking about a cure because it's so terribly difficult in advanced disease, but I think we need to start having that conversation. Otherwise, we're not going to get there. How can we actually cure people of advanced breast cancer? I think we're not there yet, but at least we have the opening... with PARP inhibitors; so building on that is part one. The second is that this genetic relationship between PARP inhibition and BRCA is just one pair of genes in the genome that has 20,000 genes in it. I think it's very unlikely that that's the only such useful relationship for therapeutics. We've already discovered some other gene drug interactions. We're very excited about something in lobular breast cancer, which has a particular gene defect. We already have a drug that might work in that context. Then, exploring this constellation of gene interactions. I said there's 20,000 genes in the genome. With new techniques like CRISPR, this is opening up to a full interrogation. We can now look globally about what the interaction of one gene with every other gene is. That's now going to produce large data that then we can try and figure out how to, it's back to translation, generate large data sets but not just stare at it and say, 'That's nice.' Actually dissect it and start to build out therapeutic approaches that we can take into clinical trials. One thing that's been an absolute joy in my career is the being lucky enough to have made discoveries in the lab. We seem so far away from the clinic, and then actually meeting people that have benefited from drugs that we've helped develop. Chris Riback: That has got to feel pretty darn good. That's got to make for a good day, at the least, if you see somebody who's personally benefiting from work that you spent years doing in the lab. Dr. Alan Ashworth: It's always a good day. It never gets old, I'll tell you. Chris Riback: I bet not. Alan, thank you. Thank you for your time, and thank you, of course, for the work and research that you've done and continue to do. Dr. Alan Ashworth: Well, thank you so much, Chris, and thanks to BCRF for helping us get where we want to go. Chris Riback: That was my conversation with Dr. Alan Ashworth. My thanks to Dr. Ashworth for joining, and you for listening. To learn more about breast cancer research, or to subscribe to our podcast, go to BCRF.org/podcasts.